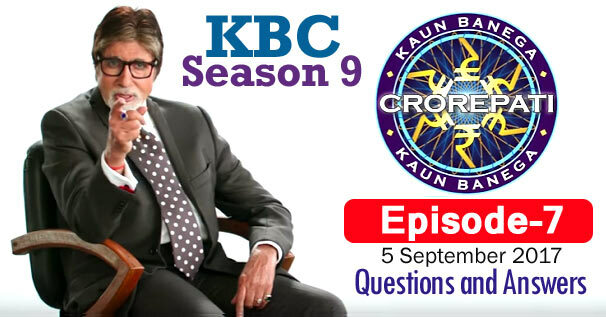 KBC Season 9 Episode 7 Questions and Answers: The seventh episode of Season 9 of Kaun Banega Crorepati (KBC) was telecast on 5 September 2017. In which Amitabh Bachchan had asked contestants 22 questions of General Knowledge. The correct answer to all the questions is given below each question. By reading these questions, you can prepare yourself for the next KBC Season 10 of Kaun Banega Crorepati. Because by reading these questions, you will understand what kind of questions asks Amitabh Bachchan in KBC. These all general knowledge questions will be helpful to for you various Competitive Examinations and Interviews besides KBC. Remember, the answer to some question may be in accordance with that time, while the answer to those question may differ according to the present time. 1. Which of these Hindi idioms means to deny or say no to something? 2. Which is the longest key on a which standard computer keyboard? 3. Your father is twice the age of your younger sister, who is 5 years younger than you. If you happen to be 30, how old is your dad? 4. The character singing this song is a fan of which actor in the film ? 5. With respect to the economy, 'direct' and 'indirect' are types of which one of the following? 6. In which sport did Dipa Karmakar represent India at the 2016 Olympics? 7. Arrange these ailments, from the bottom to the top of the human body according to the parts they mainly affect? 8. According to a song from the film 'Sultan', what does Baby like? 9. In a clock, in how much time will the second's hand complete a full circle, rotating 360 degrees? 10. Which of the following spices is actually a dried leaf? 12. Which city's name was changed to Gurugram? 13. A feature film on which of these sports personalities has not been made yet? 14. The polar bear is a native of which of these regions? 15. The main revers of Bhutan - Torsa, Wong, Sankosh and Manas - all join which river India? 16. Which team has won the maximum number of IPL titles? 18. At what age can you donate blood, vote in elections and watch an 'A' rated movie in India? 19. If someone is getting 'taleem', then what is he or she getting? 20. Which of these is one of the verification methods used while making an online transaction? 21. Which of these diseases is transmitted by mosquitoes?